Pellet dispensers - Stroj-energijska tehnika d.o.o. 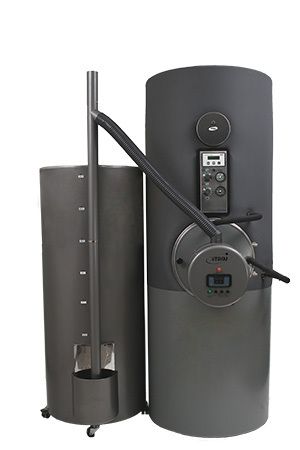 The vertical feeding tube makes it possible for the dispenser to be located beside the boiler, thus taking up less space. 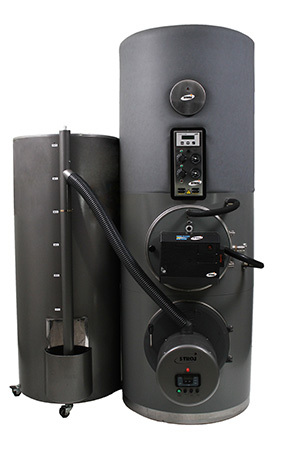 The pellet dispenser includes displays (markers) indicating the remaining pellet quantities, so you always know when to refill. The dispenser is mobile, on four wheels, for easier movement when adding pellets to the boiler and after cleaning. Its round aesthetic form is visually similar to STROJ boiler. Installation is easy and practical.